Sometimes it seems that the fight against pet cancer isn’t making any progress. The good news is that every day, veterinary oncologists are studying new and better ways to treat – even eradicate! – pet cancer. 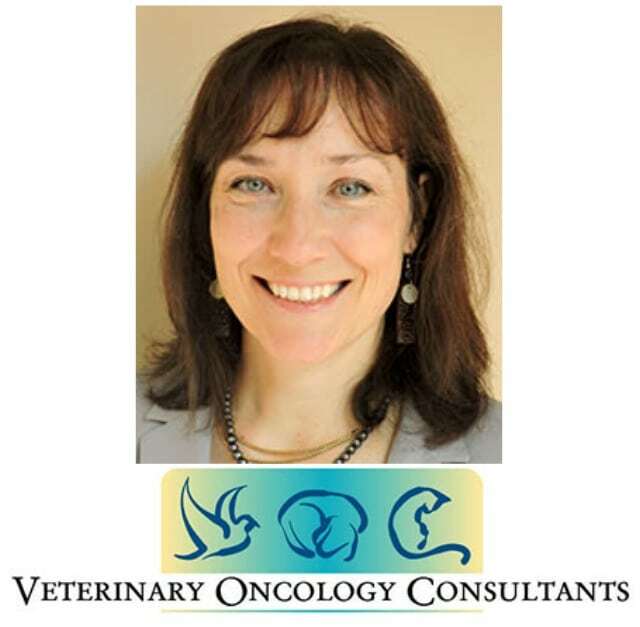 One of these heroes is Dr. Angela Frimberger, VMD, Diplomate ACVIM (Oncology) of Veterinary Oncology Consultants (VOC), a resource for veterinarians only. She recently studied the outcomes of dogs who went on accelerated chemotherapy intervals for canine osteosarcoma. This study caught our attention because it examined whether osteosarcoma outcomes could be improved by accelerating the chemotherapy schedule for treating osteosarcoma with doxorubicin and carboplatin. We selected highlights from the study’s abstract and asked Dr. Frimberger if she could explain each one in laypersons terms. We’re thrilled she agreed and hope you find her work as fascinating as we do. Can Shorter Chemotherapy Intervals for Canine Osteosarcoma Improve Survival Times? 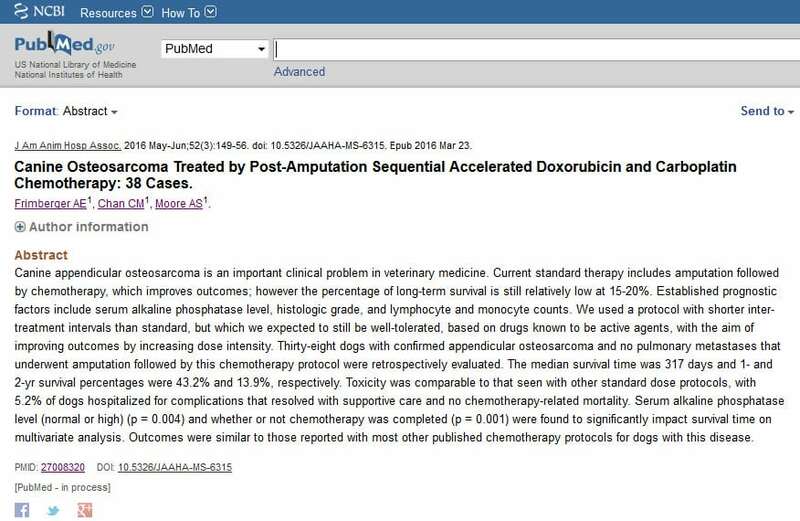 “Abstract: Canine Osteosarcoma Treated by Post-Amputation Sequential Accelerated Doxorubicin and Carboplatin Chemotherapy: 38 Cases. Frimberger AE1, Chan CM1, Moore AS1. Canine appendicular osteosarcoma is an important clinical problem in veterinary medicine. Current standard therapy includes amputation followed by chemotherapy, which improves outcomes; however the percentage of long-term survival is still relatively low at 15-20%. Established prognostic factors include serum alkaline phosphatase level, histologic grade, and lymphocyte and monocyte counts. We used a protocol with shorter inter-treatment intervals than standard, but which we expected to still be well-tolerated, based on drugs known to be active agents, with the aim of improving outcomes by increasing dose intensity. Thirty-eight dogs with confirmed appendicular osteosarcoma and no pulmonary metastases that underwent amputation followed by this chemotherapy protocol were retrospectively evaluated. The median survival time was 317 days and 1- and 2-yr survival percentages were 43.2% and 13.9%, respectively. Toxicity was comparable to that seen with other standard dose protocols, with 5.2% of dogs hospitalized for complications that resolved with supportive care and no chemotherapy-related mortality. Serum alkaline phosphatase level (normal or high) (p = 0.004) and whether or not chemotherapy was completed (p = 0.001) were found to significantly impact survival time on multivariate analysis. Tripawds Asks: How short? And in what order was the doxorubicin and carboplatin administered? Rotating? Or all doxorubicin for the first phase, then all carboplatin for the next? Tripawds Asks: How did it compare to the usual dosages given for these drugs? Dr. Frimberger: “The actual doses we used were standard, but we accelerated the schedule. Dose intensity is a concept in chemotherapy, where we look at not only individual doses of drugs, but dose over time. It is commonly measured in mg/m2 per week. It is pretty well understood that dose intensity is a determinant of outcome (i.e. 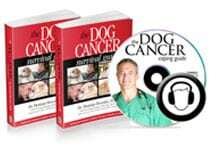 higher dose intensity = better cancer control) in various cancers in people, and there is some evidence that the same is true in dogs. Since dose intensity is dose over time, the 2 ways to modify it are by changing the dose, and by changing the time. For both doxorubicin and carboplatin, the standard doses are pretty much as high as we can go without risking undue toxicity; so that leaves time as the variable that we could work with. Carboplatin pretty much does require a 3-week interval, but what we had found was that the traditional 3-week interval after doxorubicin was really unnecessarily long; and that was the key that allowed us to accelerate the schedule without increasing toxicity. Tripawds Asks: How does this compare to typical survival times of just carboplatin? Finally, what inspired you to try this protocol? Is this something other vets can replicate? Are they doing it now? Dr. Frimberger: “I’m always looking for ways to improve chemotherapy for animals and I’ve been interested for a long time in dose intensity and nontoxic ways to increase it. We’ve had some nice success with this with lymphoma, but we didn’t have as good luck with this one – this protocol is a fine option for dogs with osteosarcoma, but it’s not a big improvement in outcome. But you have to try things and not all of them will work the way you hope. Are You Coping with Pet Cancer? Although Veterinary Oncology Consultants cannot advise pet owners or caregivers directly, they do provide case evaluations remotely for veterinarians worldwide. If you would like your vet to discuss your pet’s cancer diagnosis with VOC, please tell your vet to visit the VOC website. Great article. Thank you. Sarge is still beating the odds and his vet is actually continuing carboplatin treatments about every 3-6 months. He is now at 2 years and 2 months! SARGE! Oh my DOG you are simply AMAZING! It’s so wonderful to hear from you! I can’t believe it’s been two years. Be sure to post a blog update, we’d love to feature your wonderful story in Tripawd Tuesday OK? LOVE YOU!! !